Sensor-Crash is a crash sensor, which is used to detect whether a crash has happened. General Pin Out is the standard pin out of a Sensor / Trinket connector. Sensor / Trinket's Pin Out is this specific Sensor / Trinket's wiring in relation to the General Pin Out. SIGNAL-A / SIGNAL-B are signals that could be digital input, digital output, analog input or analog output. Or special signals such as serial communication (SoftwareSerial, IIC (I2C), etc) or other special signals. Not Connected refers to the Pin not being used for this particular Sensor / Trinket. Read more about the hub module. 1.27mm-spacing 4Pin interface connected with sensorhub. The static signal of the sensor is HIGH. After being pressed, the signal changes into LOW. The Crash Sensor is a simple Single Pole Single Throw Switch (SPST). When the sensor is not press, the electrical path through it is "open" (electrons cannot flow through it). When the sensor is pressed, the electrical path through it is "closed" (electrons can flow through it). It is an input module which produces a HIGH or LOW voltage depending if pressed or not. A Core module can read the voltage value and determine the state of the Crash Sensor. The Crash Sensor is used as a simple input pin. Therefore, the pinMode and digitalRead functions will be used. This is a simple example which outputs the state of the Crash Sensor to the serial port terminal. Note: Important lines of code are highlighted. Open the Serial Monitor (magnifier glass on top right) and set 9600 baud. This will display the serial output. Follow the Software Getting Started Guide. Select the Board, Processor and Port. Click [File]->[Open], browse to the project program address, and click "CrashTest.ino" to open the program. After confirming all these items are correct, click "→" to download the program to the development board. 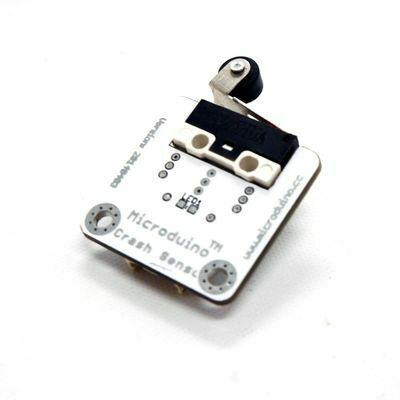 Referring to the following diagram, connect the Sensor-Crash to digital port D6 of Microduino-Sensorhub. After download, open the serial monitor. The static sensor signal is HIGH. After being pressed, it changes into LOW. This page was last modified on 1 December 2017, at 20:30.